From morning to evening, there's always plenty to do to have fun and relax on Islamorada. And remember, you can't have fun all day if you don't start early. Fine art reproductions, printing and custom framing. An Art Gallery featuring local artists with a large selection of gifts and home decor items as well as custom handmade jewelry. They offer custom framing and Interior Design Services. 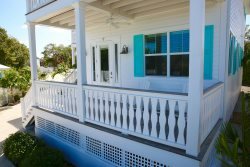 A unique Florida Keys Art Gallery featuring beautiful photography of the Florida Keys & beyond, along with oil paintings, graphic art and a photography studio. Jannette is a Florida Keys Native specializing in Gallery Art of her travels around the world, and one of kind photography of the Florida Keys. Jannette also specializes in Lifestyle Outdoor and Studio Photography for the entire family. The Gallery exhibits exclusive art work from various local artists that is not offered at any other gallery in the Florida Keys. With two galleries, Out on a Whim, at the Rain Barrel mile marker 86.7 Bayside, and the other at Spanish Gardens Restaurant, located at mile marker 81 Oceanside. Recommended as a Fodor`s Choice hotel since 2009, Kona Kai is a magical hideaway, teeming with the natural beauty of the old Keys and hand polished into one of the most exclusive resorts known to the Florida Keys. Tucked away on two acres overlooking Florida Bay and Everglades National Park, Kona Kai is a haven for vacationing adults, featuring a private beach, a temperature controlled freshwater pool and tennis court. Eleven coastal living style rooms and suites, completely redone in 2013 offer comfort and sophistication. Enjoy the serenity of kayaking or stand-up paddleboarding across Florida Bay, or join their Everglades enviro- tour. Surrounded by "The Dive Capital of the World" and "The Sportfishing Capital of the World," you`ll find the best in fishing, diving, snorkeling, boating, parasailing and other watersports activities. Along with their personalized concierge services, Kona Kai is the ideal venue for small weddings, meetings and special events. The resort offers "beach ceremonies for two" and a small meeting center for 6 to 36 persons. Established in 1997, The Gallery at Kona Kai features original artwork from around the world. Recognized as one of the top art galleries in the Florida Keys, it is also an additional space for intimate events. Opened in 2011, The Botanic Gardens at Kona Kai are a unique, not-for-profit, tropical Ethnobotanic Garden. Registered guests are offered a complimentary 90-minute tour focusing on the relationship between plants and people. Their ethnobotanic tours are also offered to non-guests, by appointment only, with a suggested donation of $25. Regularly recommended by leading travel publications and websites, guests find Kona Kai Resort, Gallery and Botanic Gardens a classic Keys experience - the perfect alternative for those seeking to avoid the crowds and formality of a big, full service resort. Art gallery, gift shop and local print studio for artists as well as for the general public - wedding printing also offered. The beautiful tropical themed art of Michelle Nicole Lowe is always available for purchase online or by phone. Just click store, on her web page or order by phone at 305.981.6424 or stop into the gallery at 81904 Overseas Highway (bayside) in Islamorada. She is open Tuesday through Sunday, from 10:00 am until 5:00 pm, and Mondays by appointment. A Not-for-Profit Organization that sponsors the Morada Way Arts and Cultural District`s Third Thursday Walkabout, which is held every month on the third Thursday in Islamorada. Locals and tourists alike benefit from the monthly Third Thursday Walkabouts, as they promote business and add culture and entertainment to the area. It is a fun three hours from 6-9pm Enjoy sunset - a wonderful monthly arts and cultural celebration in the Heart of Islamorada. Artists, sculptors, jewelers, photographers, and an ever-growing field of stimulating art and artists are available to the participants. Events will include artist receptions, music and other activities. Gallery Morada, Pasta Pantaleo Signature Gallery, Redbone Gallery, Matecumbe Studio Gallery, and Blue Water Potter are the hosts of the Third Thursday Walkabout. It is the place to be on Thursday nights in Islamorada. Morada Way Arts and Culture District also has a Large Juried Art Show in January each year. Gallery and pottery, bronze, copper studio attached to a hardwood hammock made into a sculpture garden. Open from 10am until 6pm seven days per week. Parking access on US1 and on Old Highway. Featuring Beautiful Art by Pasta Pantaleo; originals and limited editions. Visit Pasta`s gallery in the original Red Cross house built in 1937 in the heart of Islamorada. Pasta`s sportfish paintings are alive with color and movement, a must see! Paintings of Keys resorts, flowers, railroads, fish, dogs, cats, boats and more. Home of Betsy the Giant Lobster - A great photo spot with cute shops, artist galleries, a cafe, and a hot dog stand. Working Studio featuring ocean inspired fused glass - classes available. The Gallery features revolving exhibits of local and regional artists including photographers, painters, sculptors, and mixed media artists. Open Monday through Friday from 9am until 5pm and on Saturdays and Sundays by appointment. Local Movie Theater in Tavernier at the Tavernier Towne Shopping Center next to Mariners Hospital. B&B Theatres is new as of Winter 2009 - With All New Management and Ownership! Come check out the latest greatest movies and the fantastic new popcorn! See YOU at the movies! Please go to www.bbtheatres.com for showtimes. Unique waterfront shopping, fresh local fish market, caf� with fresh pressed juices, and paddle boarding/outdoor adventures all in one spot! Non-Profit Marine Mammal Education and Research Facility where you can enjoy dolphins and sea lions, chat with trainers, see theater presentations and splash in the family sprayground. Dolphins Plus Oceanside and Dolphins Plus Bayside are marine mammal research, education and public swim facilities located in Key Largo, Florida. Both are active members of the research community through the submission of peer-reviewed publications, participation at national and international scientific conferences, and the support of undergraduate and graduate research projects and scientific training. Additionally, both facilities have extensive education programs designed to promote a greater understanding of marine science, marine mammal and ecosystem conservation, and environmental stewardship. The facilities are committed to community outreach, hosting many local school groups and catering our programs to meet their needs. Dolphins Plus also provides direct support to the local not-for-profit stranding organization, Marine Mammal Conservancy (MMC). Dolphins Plus oceanside and bayside are committed to educating the public via experiential learning, while providing an unforgettable marine mammal encounter for families on vacation. Micro Brewery with tasting room! Tour the brewery and then sample the beer. Village of Islamorada Public Park for locals and visitors. Free park entry for Locals. Park entry fee for tourists is $8.00 per adult and $5.00 for youth (3-17) & Seniors (65+)$5.00 or show Islamorada hotel/resort guest pass for free park admission. Park features heated olympic swimming pool, public beach, tennis, skateboard park, marina, fitness and walking trails, dog park, basketball court, soccer and multi-use fields, baseball and softball fields, and an amphitheater. There are additional fees for pool and skate park. Call for schedule of events. Open daily from 10:00 am to 5:00 pm. Adults $12.00, children 5-12 $6.00 (children under 5 free). The History of Diving Museum is a not-for-profit 501(c)(3) educational institution focused on the Story of Man`s Quest to Explore Under the Sea. The museum offers over 3,000 square feet of exhibits featuring historic and rare diving artifacts including hands-on exhibits, videos, and fun photo opportunities. Immerse yourself in the history of diving! Don`t forget to visit the Museum Store for great diving-related gifts! Non-profit - teaching and enriching the lives of children through arts and gardening. Bring your budding artists to Sea Dragon in Islamorada for a fun filled morning of creativity with world class artist Maxine Trainer. Children will experience and learn various styles and techniques including pastels, painting, tie-dye, recycle art, pottery and more. Bead store where you can purchase beads, bead supplies, tools and original beaded jewelry. Beading lessons are available. The Discovery Center is developing exhibits incorporating a combination of static displays and interactive media, delving into first Florida Keys inhabitants; shipwrecks and salvage; Keys pioneering families; sportfishing legends and Henry Flaglers Florida Keys Over-Sea Railroad. In addition, traveling exhibits are already being presented that reflect upon nature, art or history of the Keys. Hours: 10 a.m. to 5 p.m. Thursdays through Sundays. Admission: $12 per adult, $10 for seniors. Children age 13 and under admitted free. The Discovery Center is located at the Islander Resort, a Guy Harvey Outpost. Full service concierge accomodating all aspects of travel and activities from Ft. Lauderdale to Key West. Farmers Market happening every Friday in Islamorada from 12 noon until 6pm at mile marker 90 on the oceanside near Old Tavernier Restaurant. This weekly green market offers over 40 vendors of local produce, artisan crafts, handmade goods, prepared foods and much more. Civic Organization dedicated to preserving our culture and history -- See the Heritage Trail. The members made it possible. Ice Cream! Mrs. G`s has the best ice-cream - located right in the heart of Islamorada at mile marker 82.2 on the Oceanside next to Overseas Kitchen. Mrs. G`s also has homemade key lime pie, cookie brownies and Lavazza coffee! A 90 minute, fully narrated, sight seeing tours operation out of Key West with twelve stops for on/off re-boarding. 100% money back guarantee! Helicopter and air charter tours aboard 9 passenger luxury helicopter. Available for custom tours and transportation from the airport to the destination of your choosing. A premier Theater Group presenting live theater entertainment in the Upper Keys. Our staff, crew, and cast members are professionals in the community. We welcome volunteers! Home decor, gifts, boutique, jewelry and much more!